The Mission release a new live collection next month titled The Mission Live at Rockpalast. The three disc set (2CD/1DVD) features two full concerts from The Mission - the first was filmed November 24th, 1990 while on the road in support of Deliverance and the second took place April 16th, 1995 while on the Neverland tour. Both shows took place at the venue Philipshalle (now named Electric Halle) in Düsseldorf, Germany and aired on the German television show Rockpalast. 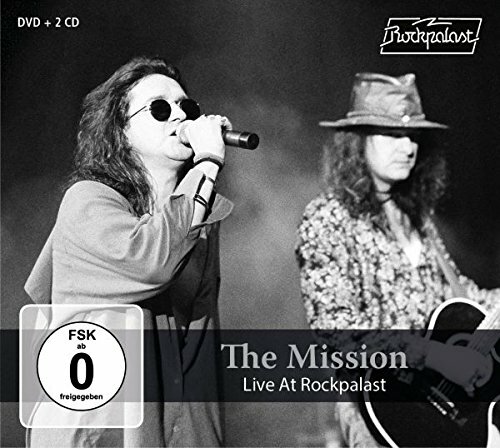 The Mission Live at Rockpalast will be released on April 27th. View the tracklisting below and pre-order here or here. Meanwhile another live set from The Mission will be released this Friday, March 30th through Cherry Red. The Mission - The Final Chapter was sanctioned by The Mission and captures the band's five "farewell" shows that took place in London in 2008 [in 2008 Wayne Hussey had stated he needed to take an indefinite break from The Mission and intended those shows to be the band's final goodbye to fans. As it turned out, a few years later The Mission regrouped to celebrate their 25th anniversary, thus the "farewell" shows were awesome, but not exactly a true farewell.] More info on The Mission - The Final Chapter is posted here.